Jordan as a destination has typically played second fiddle to its larger neighbours and usually ends up an add-on to a longer itinerary in Egypt or Israel. Last week the Jordan Tourism Board kicked off a mega tourism campaign in an attempt to alter that statistic. Eighty eight international digital influencers from over fifteen countries, along with a few local media persons, were invited to traverse the length and breadth of the Hashemite kingdom with the aim of ‘presenting Jordan to the world’ as a safe destination in its own right. I was honoured to be on that list. The challenges of hosting the mega campaign in a country half the size of my home state notwithstanding, the organisation was impressive, and the welcome and hospitality impeccable. Some misses were inevitable in the juggling of itineraries. I was deeply disappointed to have missed Petra by Night (again! ), and so was every other media professional in Petra on that date. But the hits made up for the misses. As did the many friendships forged across cultural and linguistic barriers. 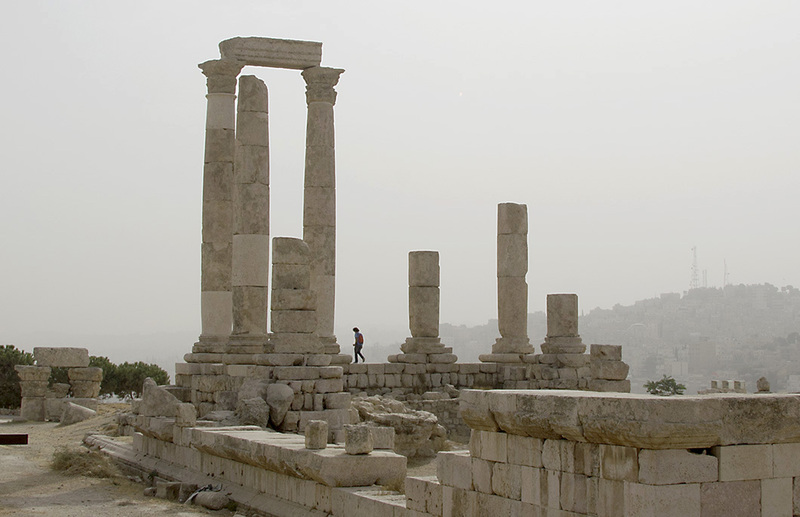 A blogger friend – Sid The Wanderer – provides a sense of scale in the temple of Hercules in the Amman Citadel. Remnants of the Corinthian columns of the Byzantine basilica with the dome of the audience hall of Al Qasr – the Umayyad Palace – beyond. R and I had skipped the Amman Citadel on our 2010 visit for lack of time (that trip was an add on to our Egypt itinerary incidentally), and so it held the most interest for me and some of my favourite shots of the trip were shot here. Jabal al-Qal’a, the hill of the citadel, sits bang in the heart of Amman city and is a veritable time machine in which we traversed an incredible 9000 years of human habitation from the stone ages through the Ammonite, Assyrian, Babylonian, Ptolemic, Seleucid, Nabatean, Roman, Byzantine, Arab and Ottoman kingdoms. That’s a lot of history to take in at one go! A poignant relic of the giant statue of Hercules that once graced the temple. Panorama of the modern city from Citadel Hill. The tall oval building at far centre is our hotel: Le Royal Amman. 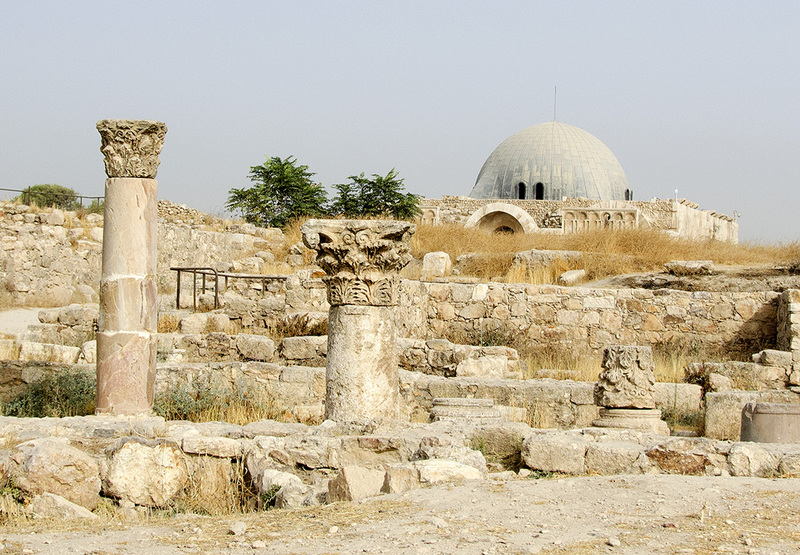 A few remnants of the Temple of Hercules, Al Qasr: the Umayyad Palace, a Roman Theatre and a Byzantine Basilica are all that stand testimony to the tumultuous journey of Amman from Rabath Ammon (capital of the Ammonites) to Philadelphia (after Ptolemic king Philadelphus) and back to Amman. 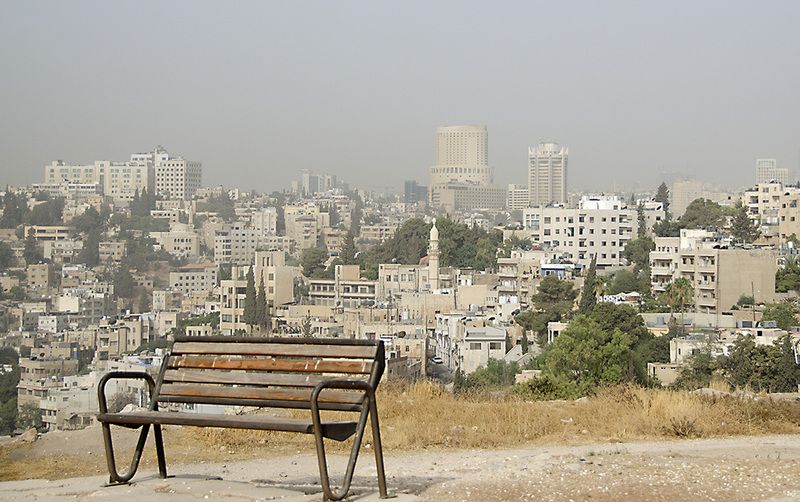 But the atmosphere and the panoramic views of modern Amman make for a most worthwhile visit. 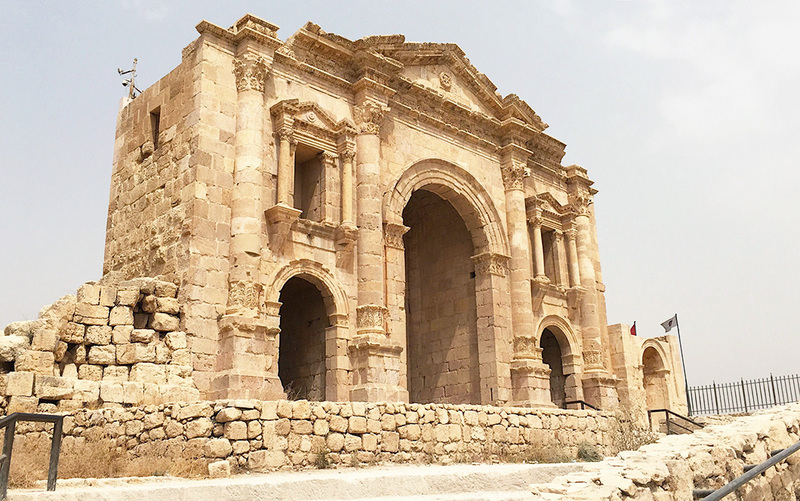 Jerash – from the pre-classical Garshu and Roman Gerasa – on the other hand is one of the most well preserved Roman cities in the world outside of Italy. Once part of the confederation of ten powerful Roman cities (along with Amman) known as the Decapolis, its importance is evident from the remains of its architecture. The grand oval plaza and the the Cardo Maximus, still bearing marks from ancient chariot wheels, have got to be the most impressive of all plazas and main streets in the region. And its theatre one of the most beautiful. Petra is undeniably the jewel in Jordan’s crown and high on the travel wish list of most every person I know. 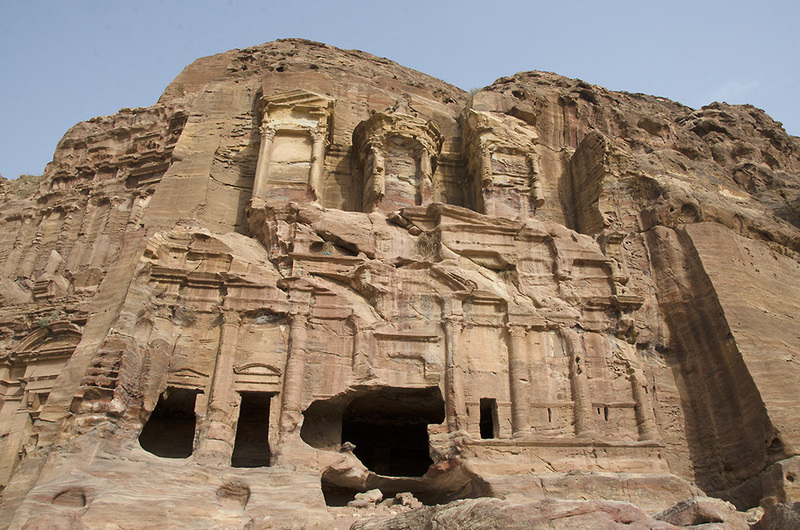 It was surprising to discover, therefore, that the country’s largest tourist revenue is earned from the biblical pilgrimage trail through Bethany, Madaba and Mount Nebo en route to Jerusalem, in which Petra is just an add on! Still, the magic of this Nabatean capital precedes it and that first glimpse of Al Kazneh (the Treasury) through the narrow Siq (gorge) never fails to knock one’s breath out. I doubt there is another monument, anywhere, that has quite such an impact on first sight. That said, there is so much more to Petra than the Kazneh, just as there is so much more to Jordan than Petra. This exquisite floor mosaic in St. George’s church, Madaba, is believed to be the earliest known geographical illustration of the Holy Lands. 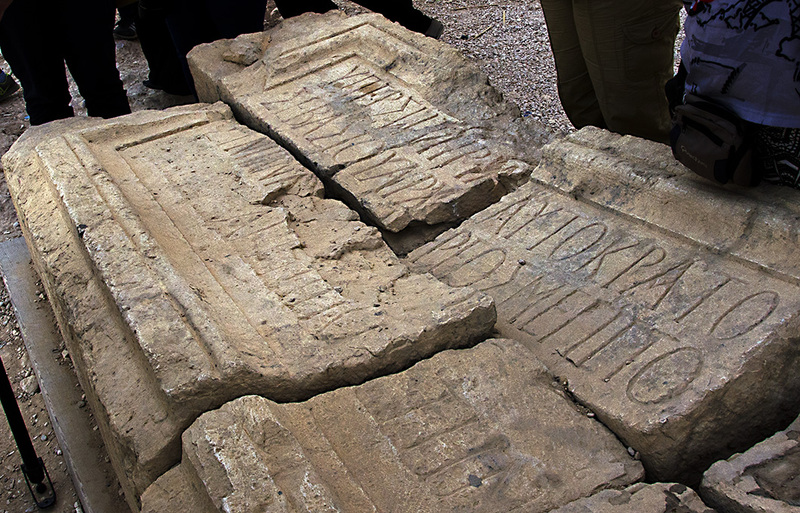 Madaba with its ancient mosaic floors completed the quartet of archaeological must do’s. We even managed to squeeze in a quick visit to Mount Nebo. Although the Fransiscan monastery on the site believed to be the final resting place of prophet Moses, was closed for renovation. The reproductions in the museum next door hinted at the treasure trove of Byzantine mosaics we were missing. I love mezze. 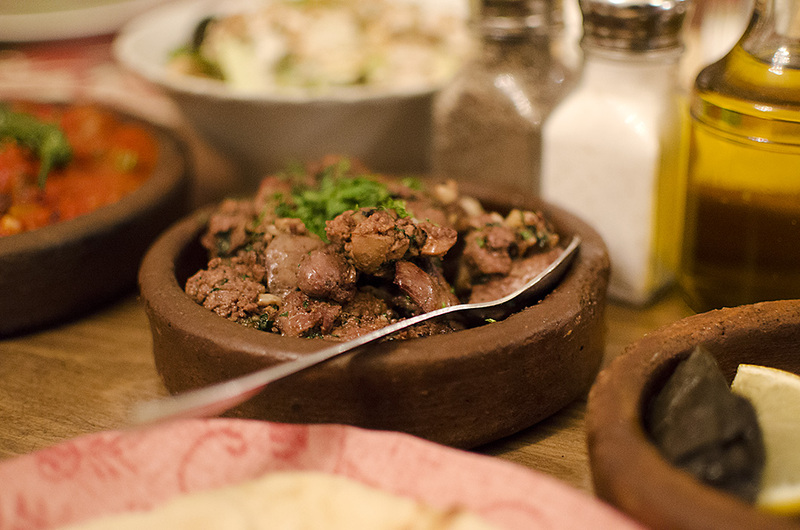 But this chicken liver starter in restaurant Sofra, was a delicious change. 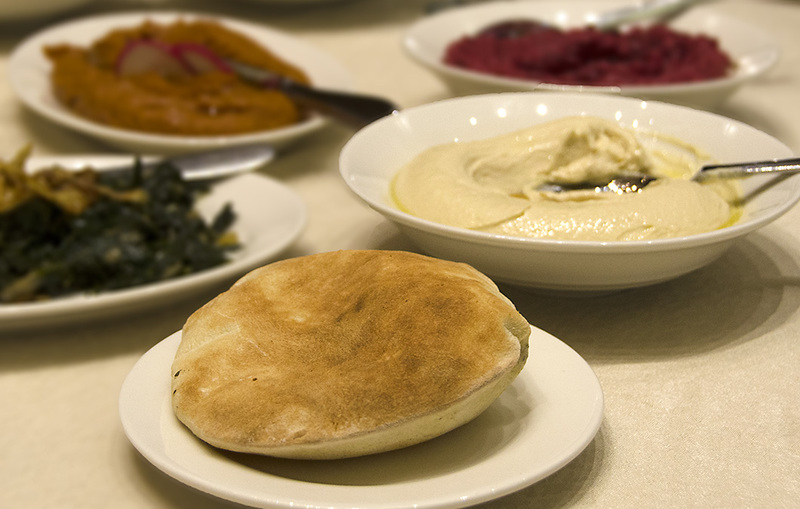 Almost every one of our meals started out with an array of delicious traditional mezze that included the usual middle Eastern suspects: Hummus, Bab Ganuj, Tabouleh, Moutabal and the lot, accompanied by endless servings of fresh, hot flat bread. This was followed by a huge meat course, and dessert or fruit. We were usually stuffed midway through the mezze, but no amount of protests would allow our hosts to dilute their hospitality! It wouldn’t do at all, you see, for any guest of Jordan to depart even an ounce leaner. This generous hospitality extended to the man on the street, characterised by the warm ‘Welcome to Jordan!” and the offer of refreshments wherever we went. 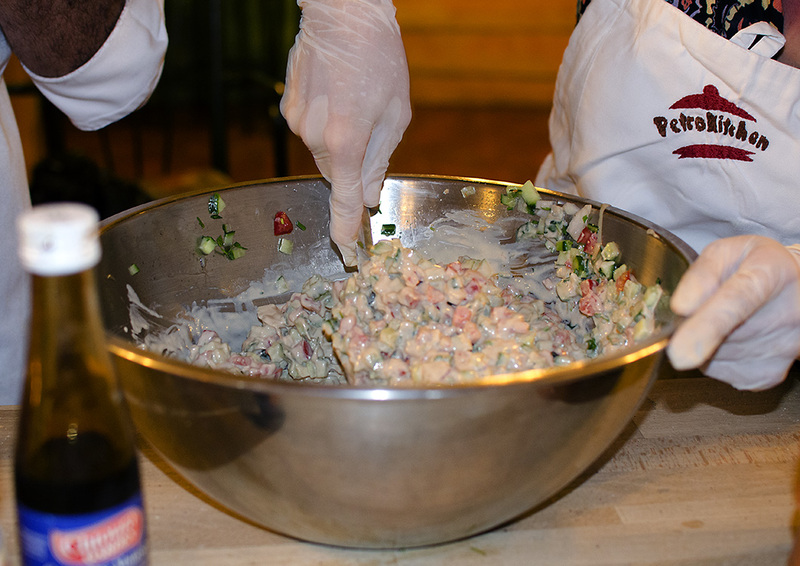 Working for our supper at Petra Kitchen! An unconventional ‘cuisine class‘ at Petra Kitchen, where chefs Ali and Tariq made us all work hard for our supper, was more fun than I had envisaged. And the result was astonishingly good considering the number of glove tips that needed to be fished out of the chopped ingredient piles! We cooked and ate the best Mansaf (lamb stew with yogurt served over rice) and salads of our trip, and the little cheese and pine nut topped breads were to die for. 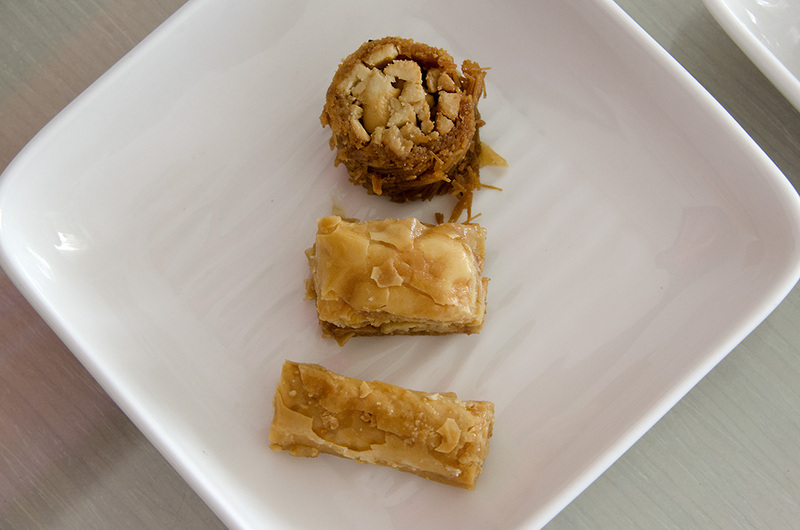 Sweet syrupy middle eastern pastries usually concluded the meal. Kunefe was a particular favourite, although none came close to the Kunefe we tasted in Habibah (Amman) on our earlier visit. I had declared early on that I wasn’t leaving Jordan without visiting the Bakdash ice cream outlet – a franchise for the legendary hand pounded Syrian ice cream brand – but between our packed sightseeing schedule and a couple of official dinners, we just couldn’t make time for an ice cream stop. The view from my bath tub in the Kempinski Hotel, Aqaba!! 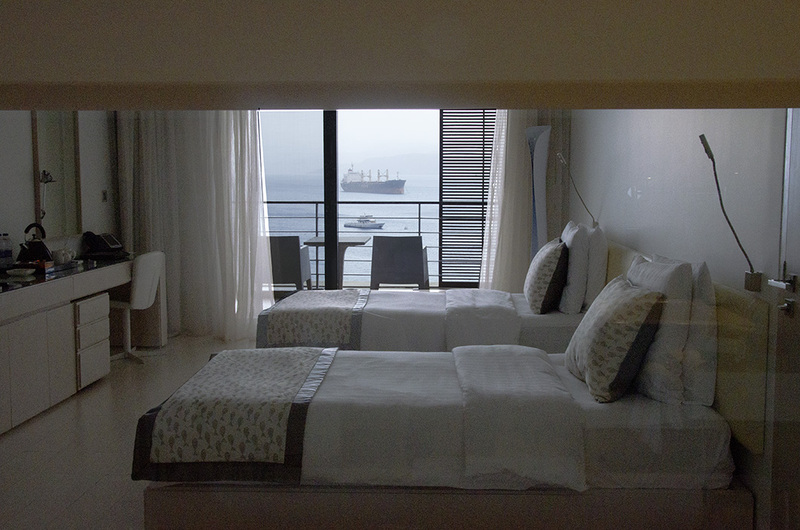 Aqaba was a welcome break from sightseeing. The Red Sea was too choppy even for some of the experienced swimmers in our group for any serious snorkelling, so we made do with a relaxing cruise and a barbecue lunch with our Georgian counterparts for company. Ending with a blissful soak in a bath tub with a view! 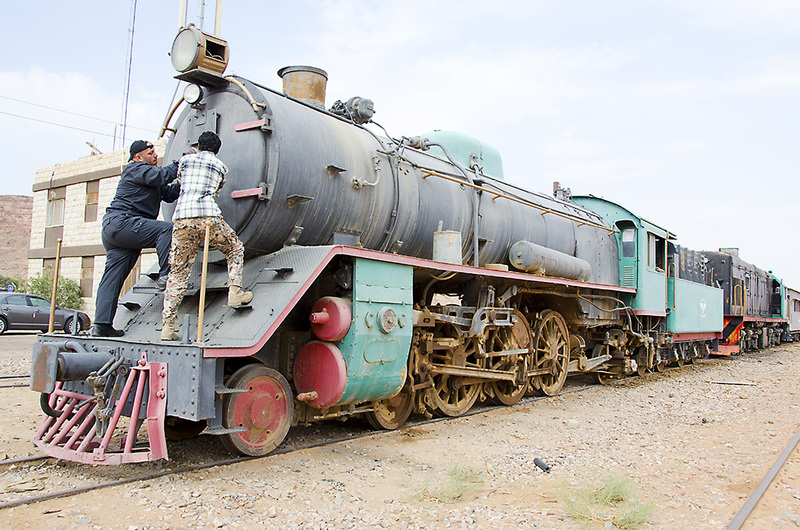 The restored steam engine of the Ottoman era Hejaz railway in Wadi Rum station. The highlight of the entire trip for me was the ride on the Jordan Hejaz railway originally conceived by the Ottomans to facilitate Haj pilgrimages from the Levant, and later used to transport ammunition and establish Turkish authority over the region. The destruction of the Jordanian sections of the railroad by Arab forces led by T. E. Lawrence was said to have been a turning point in the Arab revolt. The dramatic re-enactment of the Arab revolt of 1917……….all that was missing was a background score! Close up of one of the raiders. The re- enactment of that 1917 attack felt shockingly real! There’s no saying how any of the 95 odd passengers would have reacted to the sound of gunfire and the sight of armed horsemen swarming towards the train, without some prior warning. The mock attack culminated with the capture of an appropriately beautiful couple, followed by an animated negotiation session for their release over tea in a bedouin tent. I thought I heard someone mutter “Mad Max II!”. But I lapped up every dramatic choreographed moment with relish. Our mad camel ride across the desert at noon! As if that weren’t intense enough, us eleven Indians decided to beat mad dogs and Englishmen hollow by riding camels to our lunch venue at Captain’s camp – some 45 min out – at high noon! I was haunted by visions of my long departed mother in law throwing her hands up in despair at my deeply tanned nose, as saner bloggers who had gone ahead in motor vehicles excitedly clicked our photos. A more comfortable four wheel drive exploration of Wadi Rum immediately followed lunch, affording us a few more hours to enjoy that spectacular desert landscape. 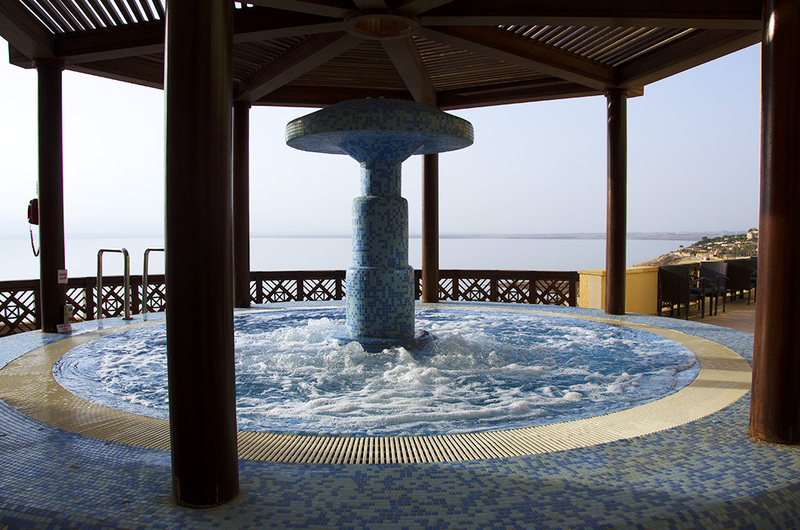 A stunning whirlpool overlooking the Dead Sea! And another fitted with every kind of pressure jet imaginable! 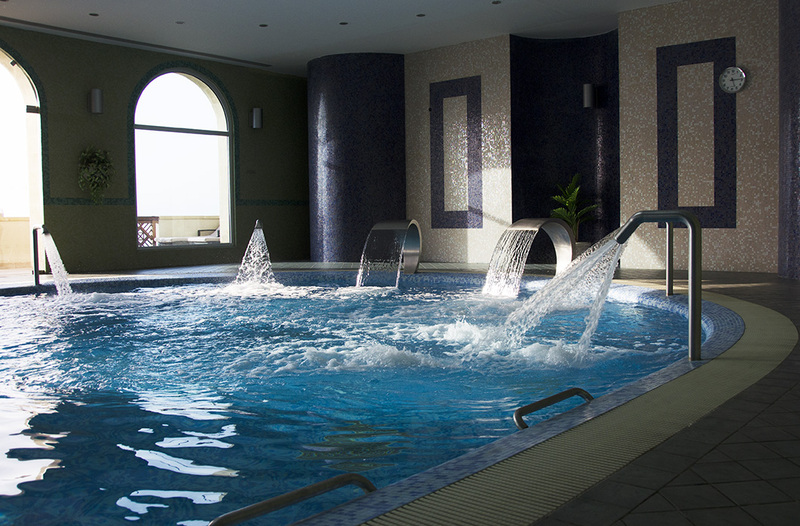 The fitting finale to our smorgasbord of Jordanian experiences, prior to a sunset dip in the Dead Sea, was the spa treatment and an hour long frolic in a series of fabulous indoor pools and jacuzzis at the Crowne Plaza Jordan – Dead Sea Resort & Spa. No matter that my limbs felt like lead after, and I could barely keep my eyes open through dinner or the flight back home early next morning. I would return one more time just for that pool. And the Bakdash ice cream. Many thanks to the Jordan Tourism Board for the kind invitation. And to our able guide Waleed Hiasat, whose knowledge and professionalism enhanced my experience manifold. Thanks Kat! I was surprised by how much I enjoyed Jordan even the second time around. I would truly return another time for all that I missed including a night under the stars in Wadi Rum. I don’t know. They were such fun when they used to jump up and down. Each time you post I grow deeper in my belief I must in my next life come back as your camera. That is my wish. Absolutely stunning, not simply for your eye which is nearly perfection but Madhu, your descriptions and your joy in telling us your wandering stories. Thank you. Enriching experience. Lovely read, Madhu. Thanks Niranjan. Glad you enjoyed it. I have shied away from FAM trips so far, but it was wonderful getting to meet so many fellow bloggers in the flesh. Hahaha, wouldn’t we all love to! 🙂 Thank you for reading Amrita. I have read couple more times to absorb the depth and vastness of the things captured in this post. Thank you very much Nihar. I am glad you enjoyed my account. Watching those pictures, I can’t help but thinking about Iraq, Yemen, Libya & the rest where their monuments, buildings artefacts were ruined by wars & destroyed Taliban and ISIS alike…. I know, it is gut wrenching to think of how much world heritage has been destroyed in that region. Jordan stands out for its remarkably secular outlook. Thank you for taking me back to Jordan just a few months after my own visit! I got to see the places I’d been and watch you doing the fun things I did (camel ride – great memory! ), but also see and learn some new things. So cool that you were given this invitation and that you got to go back again in wonderful style; you have surely done the Hashemite Kingdom proud with your post! Ha I remember chuckling over your ‘Rum Baba’ post! 🙂 Thank you Lex, it is hard to write about a destination when you are done featuring its best sights already. Great article. Love the mosaic…and the food! Thank you Stephen. That mosaic is a masterpiece. I am surprised it hasn’t been awarded the UNESCO stamp. It is supposed to be the most accurate depiction of the holy lands of the time and archaeologists still use it as a reference! 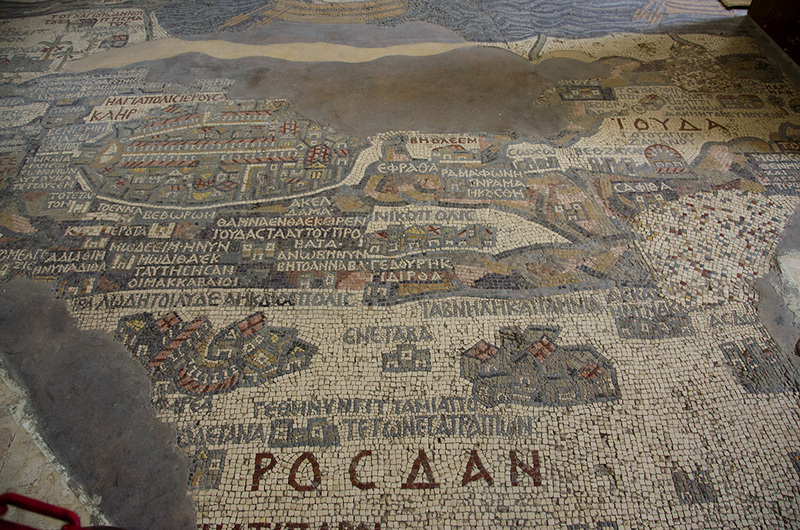 And there is no saying how many mosaics lay buried under Madaba. We saw a couple more on our last visit. Thanks for this wonderful tour. So excited to be going there in just 10 days. It would be cliched to say “you will love Jordan’, but you will! 🙂 Look forward to your live accounts Alison. I love the idea of a digital influencer, and I’m proud to know one! An evocative account of Jordan. You made me sorry I missed Amman – I only overnighted there at the British Council en route to Pella, and the stand-out experience was the taxi with the BeeGees belting out, when I hoped for Arabic music. 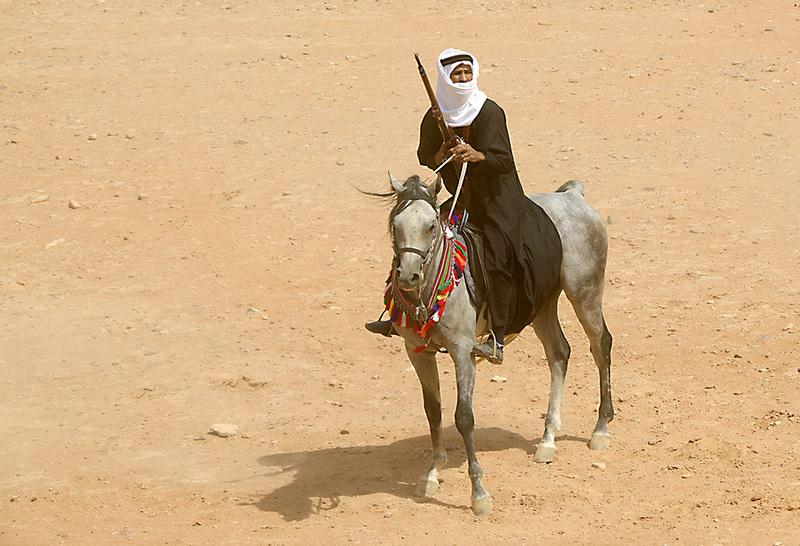 I love your account of the Wadi Rum re-enactment, and your noon camel ride. Thank you for another beautiful photo essay. Ha, I do too…influencer certainly sounds more important than ‘blogger’! 😀 Your taxi ride sounds fun. Seems like Bollywood has taken over where the BeeGees left off! Thank YOU for reading Meg. Looking forward to catching up with you and the rest of my WP community. Thank you very much Riba. It was fun and a great way to interact with fellow travel bloggers from India. Thank you Ian. I was under the impression you had been to Jordan. No, I’ve not been to the Middle East to visit. Only used some airports as transfer locations. I’ve always wanted to see some of those sites so your posts partially fulfil my desire. I only transited some of the airports there Madhu. What what a great looking trip. As you say Petra is on my list, but there seems to be much more to the country. I did almost go a few years ago, but it was a trip to all the biblical sites which didn’t interest me as much as some of the more historical places you highlighted. Then you must go again. And you are right there is so much to do in Jordan: Desert castles, hikes through stunning rugged valleys, ballon rides and adventure sports….the works. 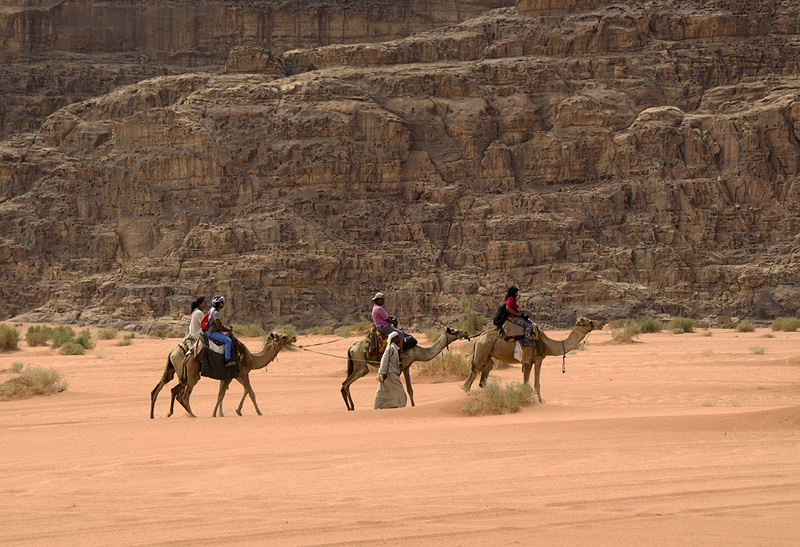 At the least include a night in Wadi Rum and two in Petra. Wow, Madhu – now I want to go to Jordan! What is your profession that helped you get invited to this treat of a trip? Travel blogging! 🙂 You should go. Jordan is incredibly beautiful and we didn’t even get to its beautiful eco reserves or participate in hikes across the stunning valleys. Madhu, I think their campaign really worked, now I really want to go. 🙂 What an amazing experience all around. Thanks for sharing the pictures. Couldn’t ask for a better response to my post David! 🙂 Thank YOU for reading. Loved this post Madhu. For some reason that image of Hercules hand laying on the ground really struck me. Thank you Jo. 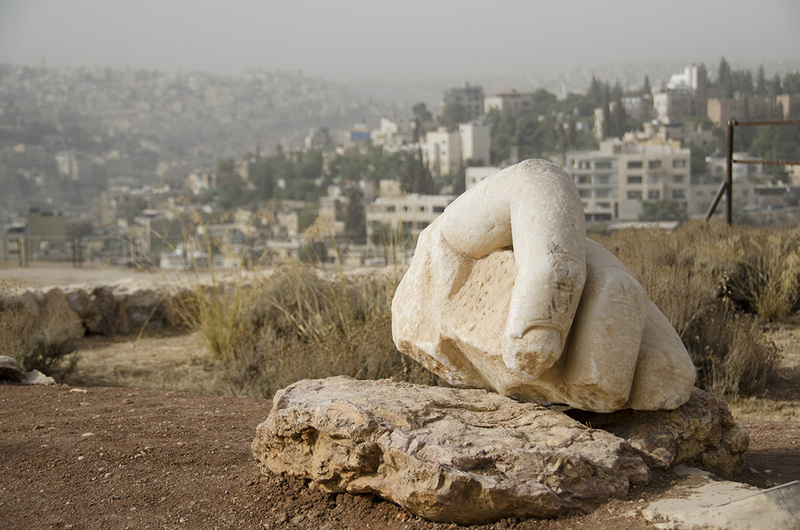 The ‘Hand of Hercules’ is indeed one of the most striking relics on that hill. My next trip into the Middle East, I do hope I can get Jordan on my list, although from your post here it seems I should make it an adventure of its own…as I’d like to spend some time here. Beautiful post Madhu, bringing out these great places for us to see. Thank you Randall. You – and your camera – might be more interested in the raw, unspoilt natural landscapes of some of Jordan’s eco reserves. I hope to stay overnight in those areas and in Wadi Rum if I ever return. I would dream of seeing such things…there is something special about seeing an unspoiled landscape and Wadi Rum would be on list of places to stay. Thank you! I LOVED going through these memories. You’ve definitely highlighted the best moments from the trip, and I’m completely in LOVE with that dramatic shot of the horses moving towards the train. It feels so real, so dangerous and so close. It is so unfortunate that you didn’t get to taste that ice cream or see the magic of Petra by night, but perhaps Jordan isn’t done with you yet. Thank you for being such an amazing travel companion, and for helping make my Jordan memories all the more special! Aww, thank YOU Revati! This trip wouldn’t have been half as fun without you! Look forward to travelling with you again someday. Madhu…well, now I see why they asked you along…you lucky little thing. Just a lovely post, with wonderful photos. I love the shot of the Kempinski, tanker in the Bosphorus (is it?). Thanks for sharing your extraordinary adventure to a place I wouldn’t get to see otherwise. Its always exciting to relive Jordan through these photos. So nostalgic. Madhu, I am so thrilled that you were chosen for this tourism campaign – it is clear that you had a blast! Jordan is very close to the top of my own wish list and not just because of Petra. I would also love to experience Wadi Rum, Jerash and the Amman Citadel. And the food looks just as delicious as I imagine! Mmm, the mention of lamb stew with yogurt on rice has me salivating already. I have a feeling you will get to see Petra By Night on your next trip back. The third time is always a charm! What a fabulous read, Madhu. A treat for sore eyes, your images; surely the tourist board must be more than happy now. I hope my dream of seeing Petra one day will come true. Now I will check out Wadi Rum right away! Thanks Madhu.